I know what you’re saying. Well, first of all, that would be a little dramatic don’t you think? Secondly, I’m not suggesting Eater will become your go to food app, and neither is Eater. For one thing, it only covers 22 American cities, and even then only points out a certain amount of restaurants covered by that most popular foodie blog, rather than show you everything there is to eat in the area. 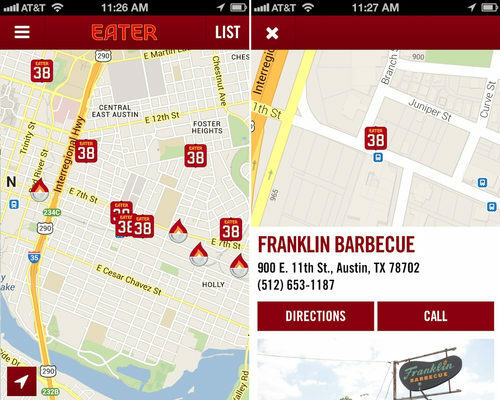 Instead Eater is best used to supplement your current restaurant locater app. That’s because the people running all branches of the Eater site are obsessed food nuts dedicated to finding not only the best restaurants (conveniently marked by their “Eater 38” symbol, denoting the 38 best restaurants in a city), but some of the most unique and intriguing as well, as featured on their constantly updating heat maps. For instance, the Eater app won’t show you what people think about that gas station on the corner’s sandwiches, unless that gas station just so happens to be a locally known only gem that serves some of the best sandwiches in the city (or maybe is actually a hidden bar). It’s best used for locals looking for a reference written by some of the most die-hard food hounds around or, even better, tourists who want to go somewhere and eat like the most in the know of locals, so that while you’re in New York you’ll know exactly where to go to experience cronut-mania, or why to skip every pretender BBQ place in Austin, and go straight to the mountaintop at Franklin BBQ. Even better, the Eater app does this through a familiar and, mostly, helpful layout that could stand to use a few technical and feature upgrades, but doesn’t provide too many burdens in looking for the best of the best in your area. There is even a quick link to the Eater blog, for those that are fans, or maybe just looking for the most up to the minute restaurant recommendations. 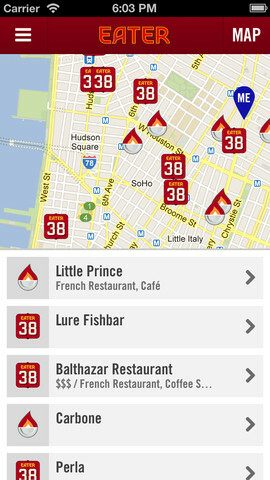 Much like those “Not For Tourists” guides, the Eater app is like Zagats, but made by the most serious of foodies. Unlike those foodies, it is able to recommend a restaurant without any snobby pretentiousness, or without being hindered by Yelp like reviews where stars drop because of that one patron who got “that look” from a waiter one time. Equally useful in finding the absolute best places to eat in 22 of America’s finest cities for both the people living there, and those just passing through, when you need access to a GPS showing the meccas of the most serious of food nerds, you need Eater, my app of the week.